Film Spot LT – a unique cinema hall at Vilnius Airport presents an updated film program for families. Starting today, two new film programs will be screened at Film Spot LT, which is the first and only airport cinema hall in the Central and Eastern Europe. The cinema hall, which is located next to the Gate 2, operates free of charge and welcomes all passengers of Vilnius Airport to spend time before their flight watching Lithuanian films, a press release from Lithuanian Film Centre states. The new repertoire consists of two programs, presenting 9 animated and short films by the most prominent Lithuanian filmmakers of the new generation. Among other films, viewers will be able to enjoy short animated films that have been awarded at international and national film festivals, including Running Lights (lit. "Kaukai") by Gediminas Šiaulys, Mr Night Has a Day Off (lit. "Pono nakties laisvadienis") and Woods (lit. "Miškas") by Ignas Meiliūnas, Noroutine (lit. "Nerutina") by Jūratė Samulionytė, Saga by Ieva Miškinytė, Junction (lit. "Virsmas") by Nathan Jureviciaus. Also, short films The Last Day (lit. "Paskutinė diena") by Klaudija Matvejevaitė, Not lucky today (lit. "Nesiseka šiandien') by Dovilė Šarutytė and The Mother's Day (lit. "Motinos diena") by Kamilė Milašiūtė. "The idea of having cinema halls in the airports is increasing in popularity among the biggest airports. We are glad to note that Film Spot LT cinema hall was one of the first ones not only in the Eastern and Central Europe but in the whole world. It is one more platform for promoting Lithuanian films and gives us a chance to reach both, Lithuanian and foreign cinema lovers. 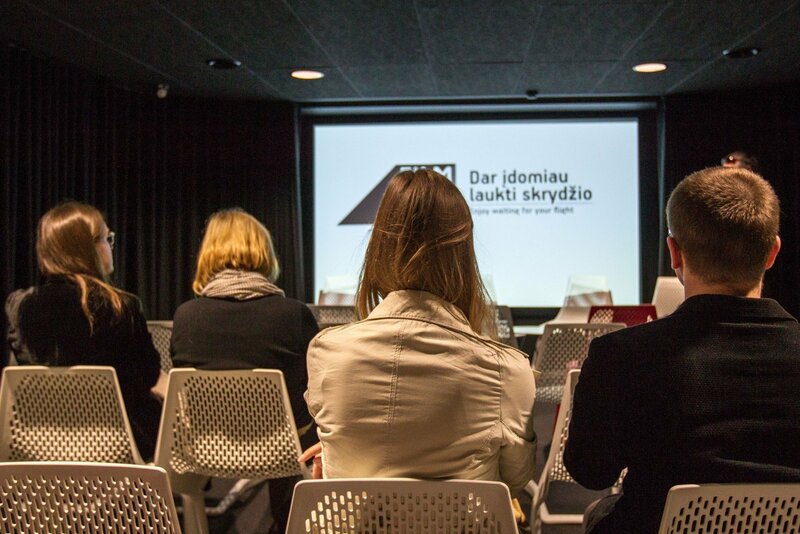 Together with our partners Lithuanian Short Film Agency we regularly updated the program. The new program is aimed at families, parents and the little passengers for whom the waiting time before the flight can be a great challenge. 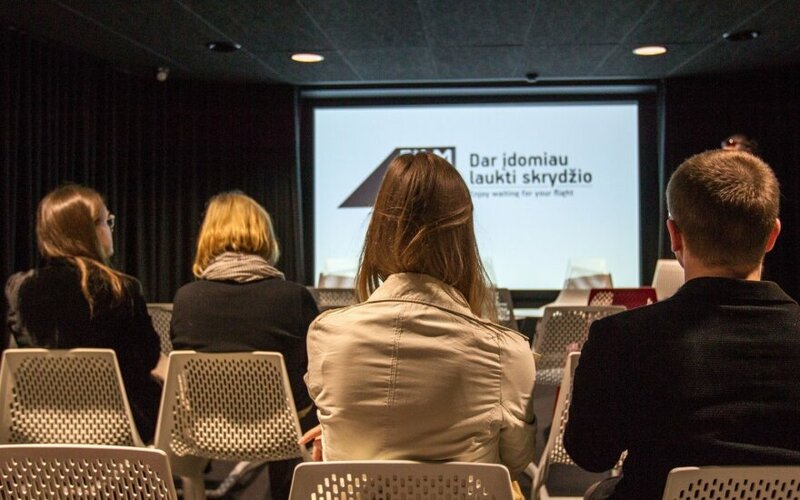 The length of the program is less than an hour to lessen the odds of missing the flight", – says Dovilė Butnoriūtė, the Head of Lithuanian Film Centre's Film Promotion, Information and Heritage Department. The Film Spot LT was initiated by the Lithuanian Film Centre in 2015. The film program was created and is regularly updated in co-operation with the Lithuanian Shorts Agency that has been part of Film Spot LT since its inception. "Very often we are praised by our foreign colleagues for this unique platform that gives an opportunity to present Lithuanian shorts for wider audiences. Every year when updating the program, we want to make it interesting and relevant to both, Lithuanian travelers and foreign visitors. We also seek to introduce Lithuanian filmmakers of different generations, promote their work and our country's cinema culture in general," – says Rimantė Daugėlaitė, the Head of Lithuanian Shorts Agency. The Film Spot LT cinema hall has 50 seats and is in the departure area of Vilnius Airport next to the Gate A2. Its working hours are adapted to the flight schedule – films are shown from the first to the last flight of the day.